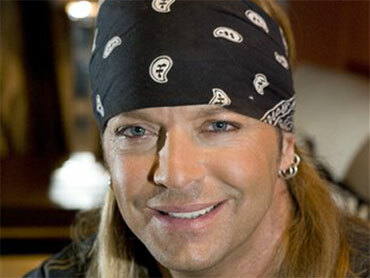 An already ailing Bret Michaels has been diagnosed with another medical malady. After suffering a brain hemorrhage last week, the audacious 47-year-old glam-rock reality TV star has developed a side effect that causes seizures, according to a statement posted Tuesday on the former Poison frontman's website. The condition, called hyponatremia, stems from a lack of sodium. The statement did not indicate if Michaels had actually suffered any seizures. Michaels was conscious and in critical but stable condition in the intensive care unit of an undisclosed hospital. The statement said he was remaining positive and responding well to tests and treatments. "Even though today was a minor setback, doctors remain hopeful for a full recovery and plan to release more specific information next Monday," it said. Michaels, a contestant on "The Celebrity Apprentice," suffered a subarachnoid hemorrhage, which causes bleeding in the fluid-filled spaces around the base of the brain. He was rushed to the hospital on Friday with a severe headache. "Doctors state Michaels is very lucky as his condition could have been fatal," according to the statement, which was also provided by Michaels' New York-based publicist Joann Mignano. "With further testing and rehabilitation, they are hopeful that Bret will gradually improve as the blood surrounding the brain dissolves and is reabsorbed into his system, which can be a very painful recovery and take several weeks to months," the statement said. Michaels was diagnosed with Type 1 diabetes at age 6. He had an emergency appendectomy April 12 after complaining of stomach pains before he was scheduled to perform in San Antonio. A statement posted on his website after the surgery said it had "taken its toll," but doctors expected him to make a full recovery. On Donald Trump's competitive reality show, "The Celebrity Apprentice," Michaels has served as one of the season's most outspoken celebrities and has so far avoided being fired in the boardroom. Before joining the show, Michaels starred in VH1's lusty reality dating series "Rock of Love" for three seasons.